Synopsys: San Jose Scale (SJS) is in nearly every Hudson Valley orchard. Management of this insect will require season long scheduling of directed applications to gain acceptable levels of control. An application of 3-1% oil targeting overwintering adults at dormant to delayed dormant, with or without insecticides, will significantly reduce the population. Oil will smother scale as adults break dormancy as their need for oxygen demand increases and temperatures rise. Applications should be made within the next 10 days as average temperatures increase and soil dries out. Tractor speeds should not exceed 2.5 MPH with no less then 100GPA for best coverage. This application will significantly reduce European Red mite. Going into the 2019 Season: Hudson Valley orchards vary in degree of insect presence relative to last years management. Factors that will contribute to the coming season management needs include individual block proximity to woodland and abandoned orchard, levels of insecticide resistance, tree fruit varieties more or less prone to insect preference and a host of factors related to new invasive pests, weather, seasonality (and the list goes on). Although there are differences between orchard infestation, two insects stand out in my conversations with growers with increasing pestilence. They are the Dogwood Borer (DWB) and San Jose Scale (SJS). 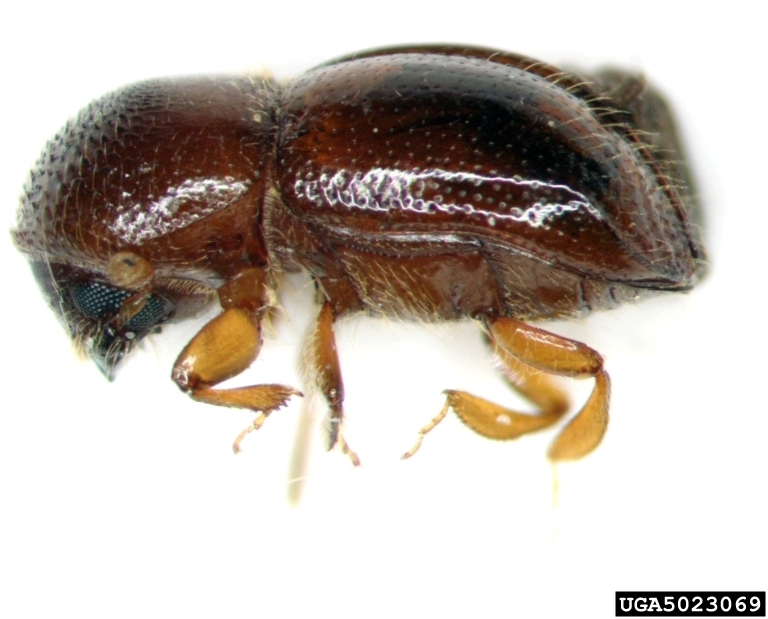 Under moderate levels of infestations in high density production systems, these insects cause tree decline in young orchards after two years of infestation. 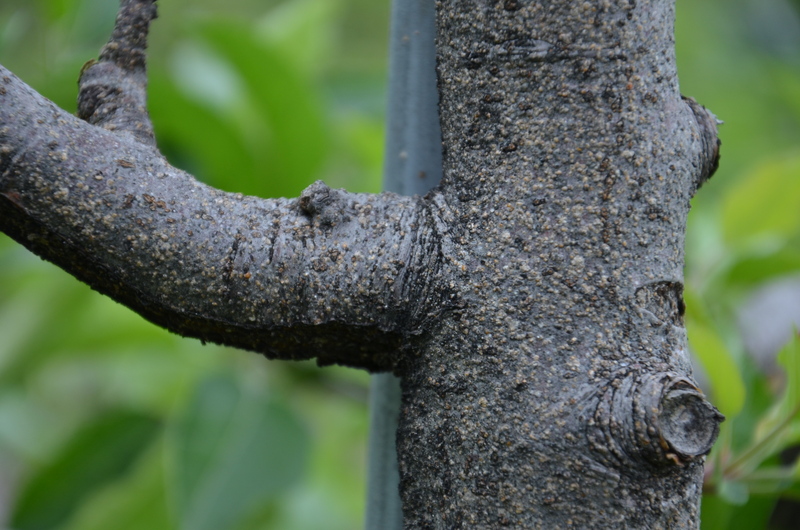 For This Week, these two pests should be on everyone’s radar: Before the season takes you by storm, you should strongly consider managing these pests if you have live DWB larva in the base of your trees, either on M-9, G-11 or other highly dwarfing rootstock, or you have had even the slightest amount of SJS in your orchard at packout in 2018. Overwintering SJS ‘Black Cap’ stage and damage to 2nd year apple stem. San Jose scale on Empire[/caption] If San Jose scale has been found at harvest, trees with infested fruit should, without question, be managed during this period to keep fruit from becoming overrun a second year as significantly higher losses will certainly occur. Be mindful that a tree carrying a few SJS damaged fruit last season will become an eruption of fruit injury the following year if left unmanaged. We have two to three generations of San Jose scale each year. The scale overwinters as immature blackcaps; adults mature during the bloom period. Males emerge and mate at petal fall. First-generation crawlers begin appearing in early June in southern areas and continue for a month. These crawlers develop into mature adults by late July. Second-generation adults appear from late July to early September; and, if a third generation occurs, it appears in late October to early November. The life cycle is completed in about 37 days. Crawlers can usually be found from early June until a hard frost in the fall. To address the SJS issue, seasonal programs will require targeted applications of specific insecticides during three key periods of the season. 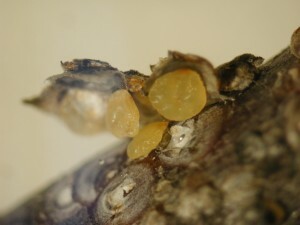 Simply, in years to come, this insect has and will continue to cause sever losses in tree fruit due to lack of pre-bloom oil use (often due to the presence of Captan fungicide), the industry loss of broad spectrum insecticides such as Penncap-M and post-bloom Lorsban as well as increasing likelihood of insecticide resistance. Addressing the overwintering population should begin at the first application of the season shortly after snow melt and navigable ground conditions if a resident population is found either through trapping and scouting or presence of SJS during the 2018 packout. Monitoring: San Jose scale Quadraspidiotus perniciosus (Comstock) (SJS): The SJS is now in the ‘Black Cap’ overwintering stage. They can be observed on 1st and 2nd year wood more easily then older wood as the branches will have a purplish hue. Cutting into the cambium will expose this color more vividly. You can observe the yellow females and males beneath individual ‘scale’ coverings where they will complete development, mate and bear live young or ‘crawlers’. Management: Pre-bloom (now) is by far the most opportune time to manage SJS. The overwintering immature stage, protected beneath the waxy covering are least protected from a spray application. However, developing foliage will increase ‘spray shadowing’ as the season progresses, reducing application effectiveness. A most effective timing during this period is delayed dormant, from the time silver tip begins to 1/2″ green. We are all familiar with the use of horticultural oil, Lorsban, Supracide, Esteem and Centaur directed against overwintered “black caps” during this period, as these are long-time standard control measures. As the living scale need to breath and metabolize food they obtain from feeding on the sap of the tree beneath their chitinous shell, smothering the insect using 1-3% horticultural oil can be very effective alone or in combination with other insecticides. Interrupting the nervous system function through the use of Lorsban, still labeled in NYS while the use of Esteem 35WP and Centaur provide can control the insect, without the need for oil as a penetrant, to disrupt SJS development. As we approach the San Jose scale pest control options available to us are numerous, and to succeed, multiple strategies should be considered. Remember, the earlier the application against the overwintering black cap phase, the greater the likelihood of success. Coverage is critical in scale management, requiring a slow travel speed (2.5 MPH), low wind speed (5 MPH) and as close to a dilute application as possible. Increased foliage equates to “shadowing” and reduced coverage, which of course is the essential control component against the overwintering life stage. Infestation levels that exceed just a few fruit at harvest in multiple blocks should be taken seriously. Even after a pre-bloom application is made, further management of populations should be considered as pockets of lingering scale in protected places are likely to remain in the tree canopy. As a follow-up to pre-bloom control of SJS, consider the use of Movento 240SC at 6-9 oz./A plus a non-ionic penetrant such as 0.25% to 1% agricultural oil or LI700 to address the San Jose Scale fruit injury at pack out last year. The active ingredient in Movento, spirotetramat, is taken into the foliage, systemically moving through plant tissue to stems, roots, and leaves to be fed upon by emerging SJS nymphs during emergence and feeding. Our research has found the single application of 9 oz./A at PF or two applications at 6 oz./A at PF and 2C will effectively control the 1st generation of the insect. Softer insecticides: Esteem 35WP (pyriproxyfen) can be employed with or without oil, acting against the pest as an insect growth regulator (IGR), a unique mode of action for use against the immature scale. As the insect matures, the insecticide acts as a juvenile hormone analog to reduce the insect capacity to molt. Centaur 0.7WDG (buprofezin), also an IGR does require a penetrating non-ionic surfactant such as 0.25% v/v oil to be effective. Movento (spirotetramat), a systemic insecticide, cannot be used pre-bloom as per label restrictions, as there is insufficient foliage for effective uptake. Movento has been found to be most effective after PF in one to two applications, requires a penetrating non-ionic surfactant used at 0.25% (32 oz./100 gal.). Incompatibility concerns over Captan use in early pest management programs for apple scab can be a formidable barrier when considering the use of oil. The possibility of phytotoxicity when using Captan near oil applications should be strongly considered when vying for a weather opportunity for SJS management windows. The Lorsban decision: EPA has dismissed the petition by the 9th Circuit Court to revoke all tolerances for use i.e. the product can still be used in tree fruit insect pest management. If chlorpyrifos (Lorsban or similar generics) is used in a pre-bloom foliar application, then it cannot be used in a post bloom trunk application. A pre-bloom chlorpyrifos application made at will have a considerable impact on San Jose scale (SJS), rosy apple aphid (RAA), emerging obliquebanded leafroller larvae (OBLR), mullen and tarnish plant bug (MPB & TPB), European apple sawfly (EAS) and white apple leafhopper (WALH). Most importantly, if bees are brought into a block in a season of cooler temperature and delayed petal fall of later varieties, a pink application provides increased management of migrating plum curculio with less pressure to remove bees from a mixed block while active pollinators continue to work king flowers. It also provides a bit of insurance if beekeepers are delayed in removing hives from mixed variety blocks. Be Aware: The active ingredient in Lorsban and the Lorsban generics is chlorpyrifos, which has a high bee-poisoning hazard. Judicious use of this product, well before bloom, is essential to reduce the risk to active pollinators. My Opinion: The most important and sustainable use for chlorpyrifos should be relegated to trunk applications only. The concern for handlers, applicators and pollinators can not be overstated as viewed by Albany representatives. New York State Assembly and Senate is poised to ban chlorpyrifos this year. We can manage SJS and the lepidopteran complex using a number of new materials. And we can employ mating disruption to provide significant control to dogwood borer with no concern for insecticide resistance. 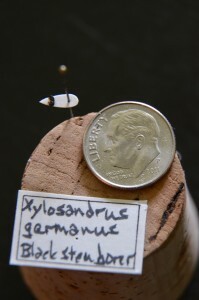 The one insect that chlorpyrifos is essential for is the Asian invasive Black Stem Borer (BSB)(Xylosandrus germanus). We can utilize the insecticide in this fashion and communicate to our State Assemblyman and Senators the need to conserve this tool for this purpose.